I've suffered from mild insomnia for as long as I can remember. I'll lay in bed for an hour or two, my body exhausted, and my mind going 100 miles a minute. It's frustrating because I know I'll be dead-tired when my alarm goes off in the morning, but I just can't get to sleep. My mind is too active. Back in college, I'd listen to music to help me fall asleep (The Cure - All Mixed Up, Depeche Mode - 101, Tracy Chapman - Self Titled). I'd focus on the music and it would help me relax a little. Myshelle prefers it quiet at bedtime so I ditched that habit a few years back. The alternative solution that I've found is staying up way past my bedtime playing video games till 1am and then stumbling to bed and passing out right away. It works well, and as an added bonus I get to play lots of video games, but it leaves me severely under-slept by the end of the week. Come weekend I could sleep in till noon if Myshelle let me (don't worry, she doesn't). So Myshelle went on a cruise to Mexico with her mom a few weeks ago and I took advantage of having the bed to myself (ok, I share with Zahava and Sophie, but they don't complain about music at night). I discovered a new solution and it's been working fabulously. I downloaded a couple sleep aid MP3s and they knock me right out. 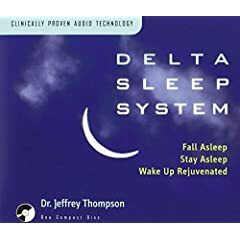 The first one I found is called Delta Sleep System by Dr. Jeffrey Thompson. There are two tracks, they both consist of nature sounds and new-age orchestration. It sounds kind of like the stuff we'd play at the acupuncturist's office where I used to work. Supposedly, there are pulses of embedded sound that encourage your brain to enter Delta Sleep. Here's a link with more information on what it is and how it works from Amazon. My results: It took about the same time to fall asleep. Once I fell asleep, my dreams were more vivid (and bizarre) than normal. I woke feeling rested. The second CD I found works even better. 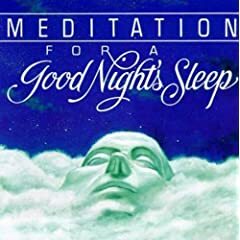 Meditation for a Good Night's Sleep by John Daniels. This also consists of 2 tracks, but the first one is a guided meditation. A deep soothing voice walks you through falling asleep. He talks about the importance of enjoying the process of falling asleep rather than focusing on the goal of being asleep. He tells you how comfortable and relaxed you are, goes over a couple breathing exercises, etc. This is followed by a second track of nature sounds and relaxing new age music. Here's the Amazon link if you want to read more or buy a copy. My results: The first time I listened, I stayed away through the entire 28 minute meditation because I was curious what he was going to say. Subsequent listenings have worked amazingly. I often fall asleep in the first 5 minutes. I can't recommend it enough!! Now the only problem is finding a more comfortable pair of headphones so I won't bug Myshelle. For all my fellow insomniacs, I hope this helps. Bonus tip for reading this posting all the way to the end: click on the album art to download a demo copy of either CD so you can try it for yourself before you buy it. Aaron - cool blog. 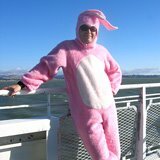 This is the first time I am visiting it (I finally figured out that I could click on your name from the comments on our site - and it took me to yours! Cool!) I added you to my list of people to check up on. Hope all is well. Tell the wife I said hello.